Which shoe is for me? The light at the end of the tunnel is not necessarily an oncoming train. Walking shoes are stiffer; running shoes are more flexible, with extra cushioning to handle greater impact. If you do both activities, get a pair for each one. Some models of running shoes look better suited to an evening at the club than a run in the park, but many of the features actually serve a purpose. Allow us to guide you through what each brand offers. Neutral Cushioned shoes offer very little or no structure or pronation support and are generally more flexible than stability shoes. Stability shoes feature a posting or firmer foam underneath as a support underneath the arch to prevent the foot from over-pronating. Also known as Motion Control shoes, these shoes are designed for runners who have very low to flat arches that over-pronate excessively. Runners with severe over-pronation tend to see very significant wear on the medial side of the sole of their shoes and often experience shin splints, knee pain, and plantar fascists if they are not wearing the correct shoes for their training. NIMBUS 21 - An improved fit goes a long way for a legendary shoe. The new engineered mesh upper adapts to your foot's movement while giving more room in the forefoot, plus the iconic GEL technology is still here to provide superior shock absorption where you want it. FLYTEFOAM Propel gives high energy return and additional cushioning, especially when it's paired with FLYTEFOAM Lyte, an additional bounce-back technology that is 55% lighter than industry standard EVA. Intended for runners who have a higher, more stable arch that do not pronate excessively. Benefits Include: New premium mesh upper offers more breathability and support, plus a spacious toe-box. FLYTEFOAM Propel and FLYTEFOAM Lyte provides supreme bounce and continuous cushion, thanks to a unique elastomer compound and the organic nano fibers. Rearfoot and forefoot GEL technology cushioning systems improve shock reduction during impact and toe-off phases, allowing movement in multiple planes as the foot goes through the gait cycle. Heel-to-Toe Offset: 10 mm. CUMULUS 20 -GEL-Cumulus® celebrates its 20th anniversary with premium technology and a refined design that offers optimal support and comfort for runners of all levels. A FlyteFoam® midsole teams up with rearfoot and forefoot GEL® cushioning for a smooth, lightweight ride that maintains full contact with the ground. Its jacquard mesh upper elevates the styling and forms to your foot for a fit that feels customized just for you. Benefits Include: FlyteFoam® midsole is light and durable all in one. Rearfoot and forefoot GEL® for the great classic cushion. Jacquard mesh upper gives a tailored and comfortable fit. Heel-to-Toe Offset: 10 mm. DYNAFLYTE 3 - Fly farther and faster in the new Dynaflyte 3. Featuring updates from top to bottom while still keeping what has made the Dynaflyte series so great, this new version is a true update. The new adapt mesh in the upper is flexible where you want it yet sturdy where it needs to be, helping your foot stay secure and comfortable. FlyteFoam Lyte in the midsole is an updated version of its predecessor, FlyteFoam, and is designed to be lighter, more durable, and even more environmentally friendly! Take to the skies in the Dynaflyte 3. Intended for runners who have a higher, more stable arch. Neutral Cushioned shoes offer very little or no structure or pronation support and are generally more flexible than stability shoes. Benefits Include: Same great Rearfoot GEL-technology cushioning system and Impact Guidance System Technology combine for comfort and fluid gait efficiency. New FlyteFoam Lyte is durable, light, and environmentally friendly. Guidance Line Midsole Tech gives vertical flex grooves for enhanced gait efficiency. Hell-to-Toe offset 8mm. GEL-KAYANO 25 has re-engineered performance with exceptional cushioning, comfort, stability, fit and protection, giving runners ultimate confidence in their shoes. When runners aren't thinking about their feet, they can get into their mental-flow state and discover what they never thought they could achieve as a runner. Also known as Motion Control shoes, these shoes are designed for runners who have very low to flat arches that over-pronate excessively. Runners with severe over-pronation tend to see very significant wear on the medial side of the sole of their shoes and often experience shin splints, knee pain, and plantar fascists if they are not wearing the correct shoes for their training. Benefits Include: GUIDANCE TRUSSTIC Technology integrates Guidance Technology Line construction for enhanced gait efficiency and provides mid-foot structural integrity. Two-Layer Jacquard Mesh Upper provides a premium fit with reduced overlays and weight. GEL Technology attenuates shock during impact and toe-off phases and allows movement in multiple planes as the foot transitions through the gait cycle. Hell-to-Toe offset 10mm. Comparable to: Nike Structure - Adidas Ultra Boost ST.
Men's Asics GT-2000 7 Running Shoe - Driven by a passion for distance and stability, the enhanced, all new GT-2000 is here to take your run to the next level. The latest silhouette update incorporates lighter and stronger materials for optimized performance and high-mileage durability. Legendary GEL technology accompanied by seamless construction, FLYTEFOAM Lyte, and GUIDANCE TRUSSTIC technology are blended together with a beautiful jacquard upper for a timeless yet modern look. Stability - Designed for runners who have flexible arches that over-pronate(or collapse inwardly). Stability shoes feature a posting or firmer foam underneath as a support underneath the arch to prevent the foot from over-pronating. The structure in this category is less than that of the Stability Plus shoes, but is adequate for the majority runners that over-pronate. Benefits Include: Rearfoot and forefoot GEL technology improves shock attenuation during impact and toe-off phases, allowing movemnt as the foot transitions through the gait cycle. New FLYTEFOAM Lyte technology has reinforced fibers that allow complete bounce-back while being 55% lighter than industry standard EVA. New jacquard mesh upper combines multi-directional stretch mesh and reinforcements that adapt to the foot, providing an exceptional fit. Comparable to: Nike Structure, New Balance 860. 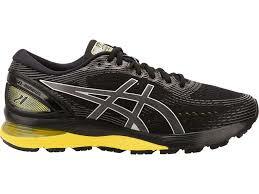 Men's Asics GT-1000 7 Running Shoe - Go farther in a more comfortable way. With Rearfoot Gel technology and the DuoMax Support System to give great comfort and light stability, your foot will be happy and healthy mile after mile. Designed for runners who have flexible arches that over-pronate(or collapse inwardly). 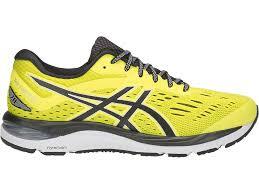 Benefits Include: Guidance Line Midsole Technology: vertical flex grooves help enhance running stride efficiency. FlyteFoam and SpevaFoam midsole: gives extra comfort and incredible bounce-back on each stride. Impact Guidance System: employs linked componentry to enhance the foot's gait from heel to toe. 12mm Toe-to_heel offset. Neutral Cushioned shoes offer very little or no structure or pronation support and are generally more flexible than stability shoes. Runners who require a neutral shoe tend to notice more excessive wear on the lateral(outside) side of the soles of their running shoes. 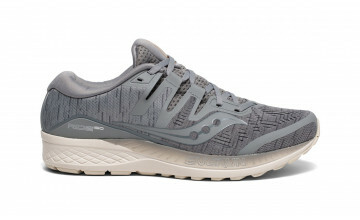 Neutral shoes can vary from lightweight and minimal cushioning to maximum levels of cushioning depending on the needs and preferences of the runner. Runners with high/stable arches tend to notice pain on the outside(lateral side) of their shins and knees and may also battle plantar fasciitis if not wearing a neutral cushioned shoe. The Triumph ISO 5 has more EVERUN underfoot than ever before to make your longest run fly by. An engineered jacquard, breathable mesh upper, combined with our ISOFIT technology, will keep your feet cool, comfortable and locked in. A FORMFIT contoured footbed cradles your foot, giving you a custom fit and cloud-like comfort. Intended for runners who have a higher, more stable arch that does not pronate excessively(roll inwards) or may even supinate(roll outwards). The newly added ISOFIT lacing system adapts to different foot shapes to provide a personalized fit, while the EVERUN layer and PWRFOAM cushioning quietly absorb impact and return energy. In addition, the new FORMFIT underfoot works with the topsole and sockliner to creates a dynamic cradling system that allows any foot sit in the shoe, not on top, and supports a wide range of shapes and patterns. Run your world today. Run without rules however, whenever in your Freedom ISO 2, thanks to EVERUN cushioning and the debut of ISOKNIT. It takes the great sock-like feel of ISOFIT and combines it with an engineered performance knit - giving you support, breathability, and freedom of movement, so nothing can hold you back. With its patented CloudTec system, you'll experience softer landings and more explosive take-offs than ever before. Which means, you;ll enjoy the ride whether you're training or racing. Wet roads? No problem. With a newly developed 'zig zag' pattern on the outsole, grip and traction are a given. And its uniquely engineered mesh puts breathability and support exactly where your foot needs them. Combine that with a second layer of EVA cushioning at the heel and you've also got a shoe that's second-to-none when it comes to comfort. The Cloudsurfer. Enjoy the ride.